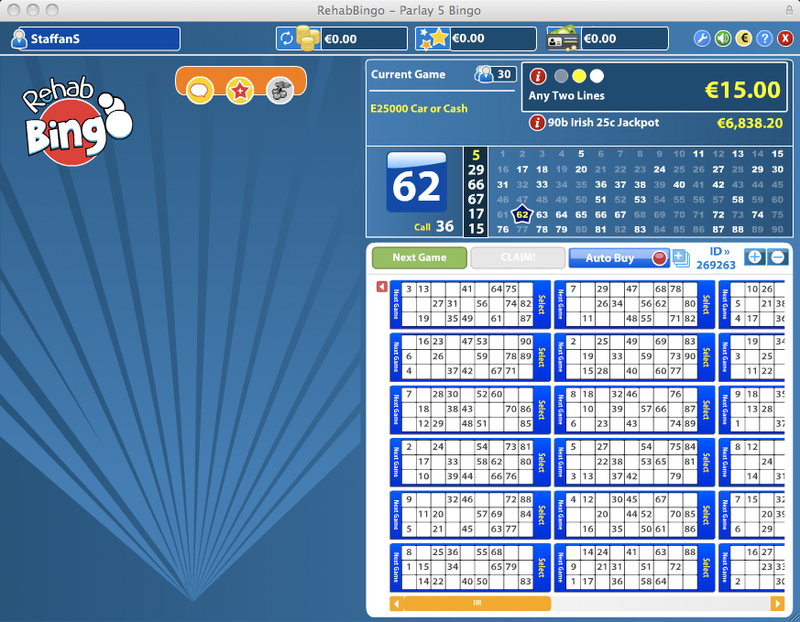 This week I’ve looked at the Parlay5 bingo client by Parlay. I’ve played on the Rehab Bingo skin. I don’t think the online bingo today is as good as it could be and I believe that the bingo software suppliers are afraid to be different from the others on the market. When will we see a online bingo where you play on a portal page and have your friends list there? So you can send them messages, invite them to play other games with you at the same time? When will we see clients on cell phones? Bingo online is going to be huge when bingo players can play where ever they are and when ever they want. Now to my redesign of the Parlay5 bingo client. This is the way the bingo client looks when it is loaded. Why is the chat hidden? You actually have to click on the chat symbol at the top to open the chat. I don’t see the point of showing a background insted. Maybe someone knows the reason? In the Parlay5 bingo client you have to click on “Next Game” to purchase tickets for the next game. I think a better solution is to show a floating welcome window when you enter the room where it is possible to buy tickets for the next round as well as giving you relevant information or promoting upcoming jackpot rounds. (I didn’t do a visual design for this since it would take more than 20 minutes). In my experience from usability tests and interviews with bingo players this is a function not used very often. I’ve thought a little about this and think the reason for this is that many bingo players wants to buy tickets with special numbers on them and they also want to do buy tickets between rounds. An auto buy function should either be much more advanced (similar to pre-buy) or simplified where it is more a function you turn on or off and don’t have to select the number of rounds and max ticket price. (I didn’t do a visual design for this since it would take more than 20 minutes). I’ve just made some minor changes to the buy dialogue that I think is very easy to implement. I am not sure the solution Parlay have is the best and the buy dialogue is one of the most important features in the bingo client so it should be designed interatively and tested on real players to see what modifications can be done to improve it. I added so that you can select 36 tickets and not only 24 in the quick select. 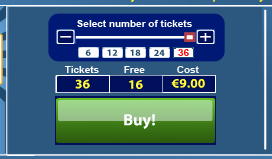 It should always allow to select the maximum number of tickets you can purchase. I also have it visible all the time. I changed the text to “Select number of tickets” insted of “Purchase Area”. I made the Buy button bigger and the last thing. I ordered the items in a more logical order: 1. Select number of tickets 2. See how much it costs. 3. Buy. These were the redesign modifications I had time to do in my 20 minutes. I believe that more could be done in the client but that is a whole other project.